Buyout group CVC has bid 500 million pounds for a 30 pct stake in the sport’s Six Nations Championship. Rugby’s governing body envisages a grander global tournament without surrendering control. Who prevails depends on how desperate a few European unions are for cash. 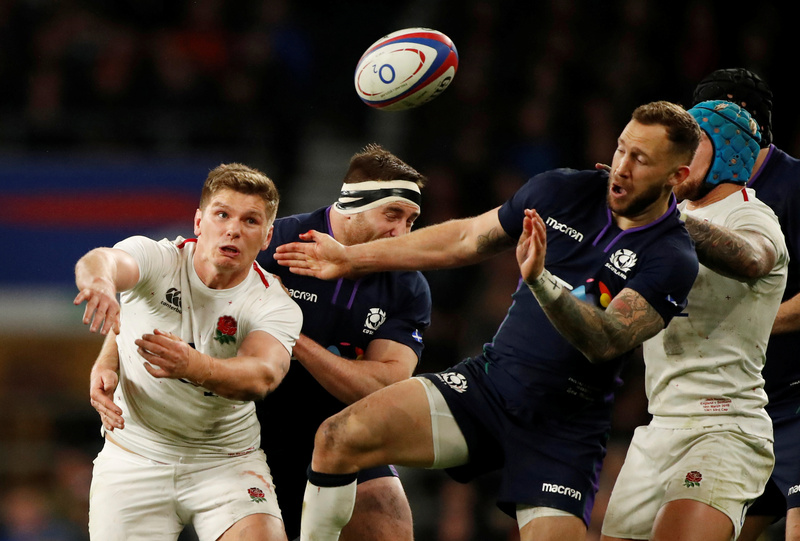 Rugby Union - Six Nations Championship - England v Scotland - Twickenham Stadium, London, Britain - March 16, 2019 England's Owen Farrell in action with Scotland's Byron McGuigan. World Rugby’s proposed global league will guarantee billions of pounds in investment while a revised schedule would address player welfare concerns, the sport’s governing body said after meeting major stakeholders in Dublin on March 14. The governing body said the proposed Nations Championship could be supported by a partnership with Swiss-based sports marketing firm Infront, guaranteeing nearly 5 billion pounds over an initial 12-year period. CVC has offered 500 million pounds to acquire a 30 percent stake in the Six Nations rugby tournament, the FT reported on March 13. Wales beat Ireland 25-7 on March 16 to win the 2019 Six Nations Championship, completing a so-called Grand Slam in winning all their games.